Former Motherwell defender Luc Nijholt has applied to become the new manager at Fir Park. Nijholt, a member of Motherwell's Scottish Cup-winning team in 1991, is currently in charge of Dutch second-tier club Stormvogels Telstar. And he told The Sun: "My agent contacted the club two days ago. "I am interested in the job. I had a great time over there as a player and I have always said that I'd like to go back as the manager." 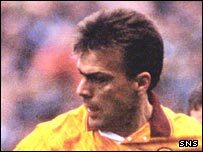 The 45-year-old Dutchman would have liked to have brought his assistant Rob Matthaei, a former Motherwell midfielder to Fir Park, but Scott Leitch has already been lined up for that job. Nijholt joins Joe Miller, the former Clyde manager, in confirming his interest in the position vacated by Maurice Malpas last week. Former Motherwell manager Tommy McLean appears to be interested in a return to Fir Park. Mark McGhee, the former Reading, Wolves and Brighton boss, has also been linked with the vacancy. But former Well and Scotland midfielder Gary McAllister appears to have distanced himself from the job. "I have not heard anything from the club," the former Coventry City manager told the Daily Record. "But, if I was to come back into the game, I would be looking to go somewhere competitive rather than having to sell anyone that could trap a ball. "You don't expect to go into Motherwell and get millions and millions of pounds to spend. "But, when you take a job like that, you want to have a chance of being competitive rather than hanging on. "That would be my big concern about going there."